This is no ordinary grill. This durable product can be used for Grilling, Baking, Slow-Cooking, Smoking, and Roasting! There is an accessory for every need, including: pizza stones, woks, calzone presses, and stuffed burger makers. With a variety of sizes to choose from, it is easy to find the Big Green Egg® that fits your cooking needs and your budget! 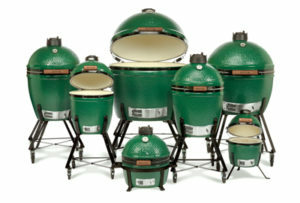 Stop in to the store today for more information or visit the Big Green Egg® online to view a full catalog of products.